Will third time be the charm? Why for the third time, why? Is it for love or for emotional demand? These and many other questions have been gushing in since last Saturday, January 12, when the news of the traditional wedding of the city socialite, Princess Juliana Ejaro Edewor, filtered out. For the mother of popular TV girl, Eku Edewor, her story seems a proof that love can find you at any age and you can even get multiple chances at it, even though, not everyone is so lucky. The tall fair-skinned businesswoman, who is in her 60s, last weekend, tied the knot with her fiancé, Dr. Victor Izegbu, in an intimate traditional wedding which had in attendance only close friends and family members. And her excited daughter shared photos from the wedding on Instagram, with a beautiful long caption that told of how lucky her mum is and revealed the marriage makes it the third time her mum is tying the knot. According to Eku, her mother has been both a divorcee and a widow. After divorcing Eku’s British father, Hugh Thorley, Juliana married a Nigerian businessman, Peter John Claudius Adeniyi Thomas, who unfortunately passed on in 2009, 15 years into their marriage, and now 10 years later, Juliana has found love again and re-married for the third time. 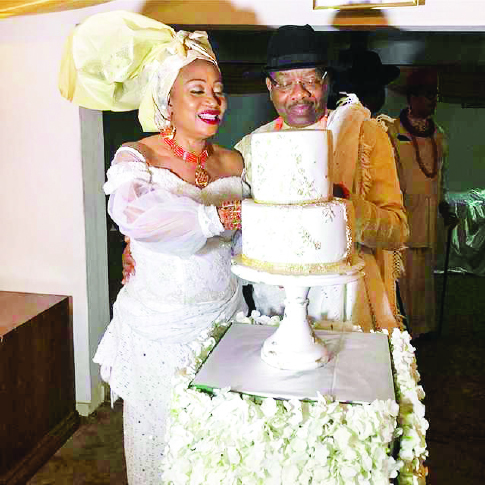 At the very private ceremony held inside the Edewor family home in Delta, the blushing sexagenarian bride, who flaunts looks that belie her age, had the company of her old friends including Cecilia Ibru, the widow of late billionaire Oloorogun Michael Ibru. It was gathered that when Juliana’s sweetheart, Peter Thomas died in 2009, his friends and associates were greatly saddened. Worst hit was Juliana, whose father was the successful magnate Chief James Edewor. But much later, she got over the grief and went about her business, stylishly attired in trendy wears and bright smiles that always light up her face. Until the traditional ceremony to formalise their relationship last week, Spotlight gathered that the couple has happily been living together. Juliana, the mother to twins –Eku Edewor and Kessiana Edewor – is one of the early pioneers of interior decoration in Nigeria. In addition to operating successfully as an interior decor expert –she runs Showcase Interiors—and has clinched many plum jobs in the process. She owns Chardonnay and The Green Room, two highend restaurant and fun spots, located in the classy neighbourhood on the Island in Lagos.